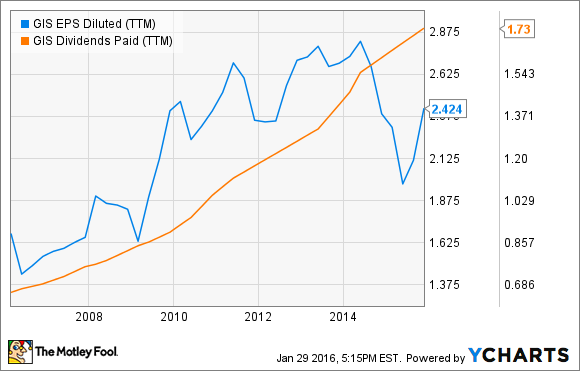 Will General Mills, Inc. Raise Its Dividend in 2016? With competition emerging and growth slowing, now may not be the time for General Mills to increase its dividend. One of the great strengths of a consumer staples company like General Mills, (NYSE:GIS) is that its business is consistent enough to pay a regular dividend, which it has done in spades. The company has paid a dividend for 117 straight years without any reduction in that history. But General Mills' business may have lost some of its luster as new competitors have entered the market and sales flounder. Is another dividend increase in store for 2016 or is that too much for investors to ask? General Mills' shelf space is under attack from organic and natural products. The big challenge General Mills and other food companies face right now is the emergence of organic and natural foods that are taking up more and more shelf space at grocery stores. The result was a 3% organic decline in revenue in the U.S. last quarter and an overall organic sales decline of 5%. There's no great answer to how General Mills can adapt to this competition. It's tried acquisitions like Annie's and Epic Provisions, but those purchases come with a high price and the products immediately lose some of their cachet when acquired by a multinational corporation. From a dividend standpoint, acquisitions eat away at cash that could otherwise be used to pay back shareholders. And that may be the bigger concern given the way earnings are trending. Can the dividend go up without repercussions? What dividend investors want to look at when analyzing room for dividend growth is the payout ratio. This is the ratio of a dividend payment to net income or free cash flow per share. A payout ratio of around 50% is desirable because it leaves some extra cash for organic growth or expansions, whereas a payout ratio over 100% shows a company paying out more than it's taking in. In the chart below, you can see that General Mills paid out less than half of earnings as recently as 2012, but that ratio now stands at 71%. As you can see, the dividend keeps going up but earnings have stumbled as sales dropped and cost-cutting can't keep up. GIS EPS Diluted (TTM) data by YCharts. General Mills would like to keep increasing its dividend in 2016, but unless operations start to improve quickly, it probably shouldn't. The payout ratio is creeping slowly toward a dangerous level, and if the company is going to transform its business to be more organic and natural, it will have to make more acquisitions, which requires cash. This doesn't mean that General Mills won't increase its dividend this year because it's on a long streak of increases and management probably wants to keep that streak going. But in the interest of long-term health, it can probably use that money elsewhere to improve its business, something that's sorely needed for this dividend stalwart.